Roberto and Co are delighted to offer this immaculately presented five bedroom family home, situated in one of Broxbourne's premier roads, on a mature plot in the region of 1/3 of an acre. This detached property benefits from a spacious and impressive kitchen/breakfast room, utility room, spacious family room featuring an impressive open fireplace, and a fitted bar area. 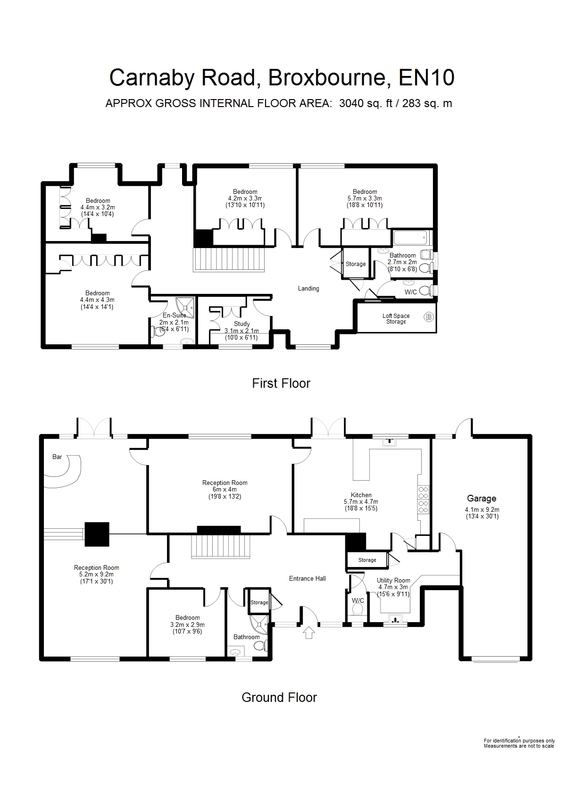 Benefits also include a separate lounge with feature fireplace, sitting room/bedroom six, a ground floor shower room, as well as an additional ground floor cloakroom. The first floor of this property boasts five spacious bedrooms, with an En-suite to the master, a family bathroom and separate wc. This property is accessed via a carriage driveway with off street parking for ample vehicles and also benefits from a double tandem garage. To the rear is a secluded garden which features a large terraced area and beautifully maintained lawns. Carnaby Road is regarded as one of Broxbourne's most sought after and prestigious roads and is ideally situated within close proximity to local amenities which include Broxbourne schools, shops and railway station.